This is not a book everyone will find satisfying. It is not a scholarly history; it focuses on great personalities rather than wider social, military, or intellectual movements. It is not particularly analytic; the author attempts to explain the Crusades and their impact in a brief concluding chapter. And, as the title suggests, it is essentially one-sided. Amin Maalouf, a Lebanese Catholic writer who lives in France – and is a member of the Académie Française – presents things very much from the point of view of Arab Muslim chroniclers who lived through the Crusades, who wrote of the Franj as barbarous, unwashed, promiscuous brutes who had invaded the House of Islam without provocation and who must be expelled, no matter how long it took. (One irony Maalouf notes: although the chroniclers were Arabs, the leaders of the Muslim party were, virtually to a man, Kurds and Turks). Why, then, is this book, first published almost thirty years ago and recently re-released in a new edition, a “classic”? 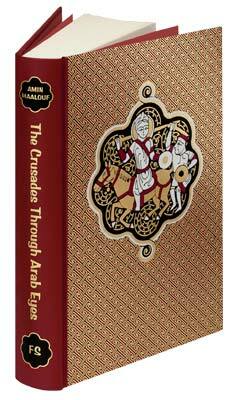 Because Maalouf is a vivid writer who brings the past alive and who offers insights on the two-hundred year clash of civilizations the Crusades represented. He details the kaleidoscopic pattern of alliances that formed and dissolved: Christian against Muslim, of course, but also Sunni against Shia and Western Christian against Eastern Christian. Allegiances could shift rapidly: a Shia caliph in Egypt might seek the aid of the Franj against his Sunni rivals in Syria, for example, but only until the Franj themselves seemed too powerful, whereupon Shia and Sunni would unite against them. Notwithstanding temporary alliances, though, Muslims saw the Crusaders, in the words of Malise Ruthven’s new introduction, as “unambiguously alien,” quite unlike other Muslims, and even unlike the Jews and Eastern Christians who already lived among them. In the end, there could be no permanent accommodation with the people from the West. The city is as holy to us as it is to you; it is even more important for us, because it was there that our Prophet made his miraculous nocturnal journey, and it is there that our community will be reunited on Judgment Day. It is therefore out of the question for us to abandon it. The Muslims would never accept it. As for territory, this land has always been ours, and your occupation is only transitory. You were able to settle in it because of the weakness of the Muslims who then peopled it, but so long as there is war, we will not allow you to enjoy your possessions.